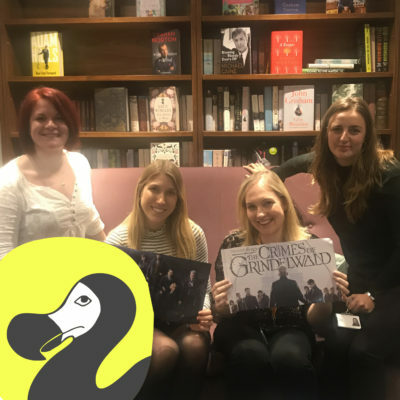 Calling all fans of Harry Potter and the wider magical world, Hodderscape have a lively discussion for you on the new wizarding world movie, Fantastic Beasts: the Crimes of Grindelwald. We couldn’t decide who should write the review so we decided that a one-off discussion would be perfect! WARNING: THIS POST AND THE RECORDING CONTAINS SPOILERS! Who is Credence then really? What does this new story arc with Queenie Goldstein really mean? What do we think about the inclusion of Nagini? And all the other new characters? Did we see enough about the relationship between Dumbledore and Grindelwald? Who is the mysterious Phoenix? What was this movie really trying to do? Is it a bit too jumbled, or is it totally epic and building into something bigger? Plus, obviously our ratings out of 10! If you are a Wizarding World fanatic then this is a must listen! And we would LOVE to hear your thoughts, so please leave your comments below. Maddy, Mel, Becca and Thorne are all massive fans of Harry Potter. Disappointed that they didnt receive acceptance letters from Hogwarts, they decided to dedicate their time to working in publishing instead. I think it is very interesting as it provides a new insight into the wizard world.It is however just a stop-over film leading on to further adventures.